Nothing can harm you. Nothing can drag you down. When your strength is unlimited, it comes from the deepest, most fearless heart. Looking hard into the eyes of your future, you are steady and master it. It kneels before you, in awe. The allure of Rose Rebelle Respawn is boundless. That really sounded like something I needed to try for the new year, so I ordered a small sample vial. I've been wearing it all week, and I'm enjoying it so much that I'm considering purchasing a full bottle. Not that I need a full bottle of anything, these days, but this one is awfully tempting for me. I admire and enjoy the original 100% Love (enough to have included it on a list of 25 must-try rose perfumes), but I personally find it too jammy-sweet in its fruit notes, too hot-pink in its florals, to wear on a regular basis. A small sample is all I need to own, for occasional weekend use. Rose Rebelle Respawn is indeed a close relation to 100% Love et al., but it's been re-interpreted in a way that makes it easier for me to wear in daytime, on mass transit, even (lightly) in the office. To my nose, Rose Rebelle Respawn doesn't have the bright red fruit notes of 100% Love, and the volume has been turned down on its rose and chocolate notes. The opening contains a new, soft-yet-fresh green note; I wouldn't necessarily be able to identify it as mint or ivy on my own, but I do like it, and I admire the way it fades into the rose and carnation. The dry down is a blend of sheer, powdery chocolate and light musks that has a "skin scent" feeling for me. As usual, you should remember that my general tastes do veer towards the sweeter end of the spectrum; Rose Rebelle Respawn is certainly a softer, gentler version of 100% Love, but it's still a quirky-romantic "fleurmand." It has low sillage, but very good staying power for an Eau de Toilette. If I do purchase a full bottle for myself, I'll wear it often. 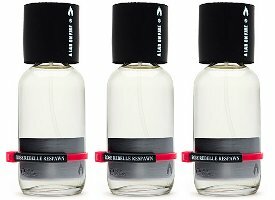 A Lab on Fire Rose Rebelle Respawn is available in 15 (approx $33) or 60 ($100) ml Eau de Toilette. For buying information, see the listing for A Lab On Fire under Perfume Houses. Thanks, I’ve been hoping of a review of this one for a while! I can’t believe I didn’t try it sooner! July seems like yesterday. Time flies! Hmm. Interesting. I didn’t realize that S-Perfumes was involved in any way with A Lab on Fire. I’m still wary of those cocoa notes – I despise chocolate in any form in my perfume, though definitely not in my mouth, and I haaaaaaaated 100% Love with a passion. The rose was all screamy and the patchouli in it just killed me, but the texture was very pretty, a silky giving thing full of air. Sigh. Yay for 15ml bottles, though. Oh rats–I was just about to say, me too, knowing it comes in 15ml is a big inducement for me to try! Hm well. Maybe they will hear our plea! I am now officially Tempted by this. I’ also usually turned off by cocoa or chocolate notes in perfume – like fruit, I prefer to eat it rather than wear it – but this sounds intriguing. Perhaps a sample needs to be in my future as well. It’s not overly chocolatey — I don’t think anyone walking past me would think, “oh, cocoa.” It’s very well-crafted — not surprising, for S Grojsman! I purchased a sample soon after NST announced this — it sounded very promising. It did not grab me, but I only tried it once. I guess that with a name like that, I was hoping for some real spiciness from the carnation. I will have to re-visit it. It’s definitely less “rebelle” than its name! Hope you’ll like it more on the second round. I have the original 100% Love, which I do really love. I don’t wear it often, but I don’t wear anything often, actually. I also remember ordering it via Sacré Nobi’s original website, which now redirects to Luckyscent, sadly, instead of the company that used to do it (it had a strange name like The Shaping Room or something). Not only was the customer service great, but they always threw in a free bottle of one of the other scents! I ordered some Lab on Fire samples from Luckyscent the other day but unfortunately did not order this one because I don’t like the name, which sounds like a mashup between Rihanna’s Reb’l Fleur and Lady Gaga. It sounds like I should give it a shot anyway. I forget, have you tried Lush Rose Jam? I’m surprised by how much I like that. I love Lush Rose Jam!! I’m using my bottle verrrry slooowly. I wish we could order directly from A Lab on Fire, too. They’re so mysterious! This sounds delightful, and yes, for once the press material speaks to me. I know — I usually either roll my eyes over the press blurb or forget it as soon as I finish reading it (same old same old), but I like this one! Almost completely off topic: When you mention “skin scent” I am reminded of a really good scent from The Body Shop of all places called ‘of a woman.’ Very skin, but something more. A tiny dot of blackcurrant, I think.